The harrowing story of the ill-fated Endurance, now in paperback. Ever since the first grade, Jennifer Armstrong knew that she would become an author. She loved making up stories and sharing them with others. Her family treasured books and this led her to become an avid reader of all types of fiction. It was no surprise when she chose to study English and American Literature at Smith College in Massachusetts. creating picture books, easy readers, chapter books, young adult novels, as well as nonfiction. Armstrong, who grew up outside of New York City, now lives in Saratoga Springs, New York. 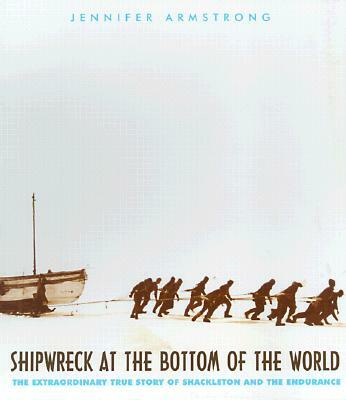 Jennifer Armstrong is the winner of the Orbis Pictus Award for Outstanding Nonfiction for Shipwreck at the Bottom of the World. Many of her books have been designated as Notable Books by the American Library Association and the International Reading Association. For more information on Jennifer Armstrong, visit her website at www.jennifer-armstrong.com, or read her blog at www.jennifer-armstrong.blogspot.com. "A book that will capture the attention and imagination of any reader." "This unbelievable story is enhanced by the vigorous prose; from the captivating introduction through the epilogue, it is the writing as much as the story that will rivet readers." "Armstrong's absorbing storytelling, illustrated with dramatic black-and-white photographs, makes this an enthralling adventure."